The Iowa Brittany Club is proud to host the 2015 ABC Central Futurity, and welcomes you to Iowa and the great Midwest! The Central Futurity field events will be held at the Union County Ranch near Thayer, Iowa on Thursday, April 2nd with the Central Futurity show events to be held on Friday, April 3rd at the Creston Alternative School in Creston, Iowa. Central Futurity information is offered below, as well as at the following sites…and will be kept updated with additional information through the countdown to the event activities. Be sure to get a great memento of your Futurity experience with the 2015 Central Futurity gear now available for purchase! The Central Futurity caps and fleece jacket are high quality clothing with handsome embroidery of the ABC Logo and 2015 Futurity, as well as options for personalization. 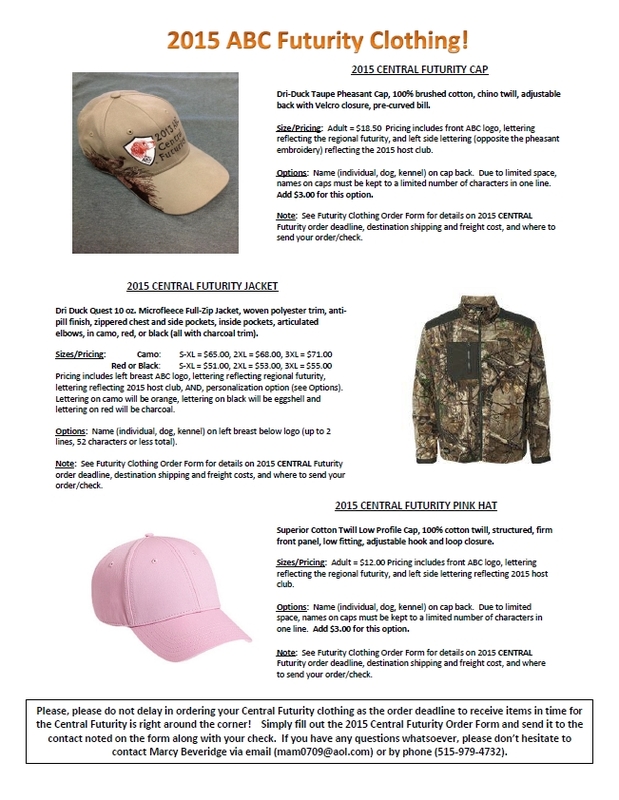 Please refer to the clothing flyer for base pricing on the clothing items as well as the cost to personalize any clothing item offered; the order form outlines freight and sales tax amounts. 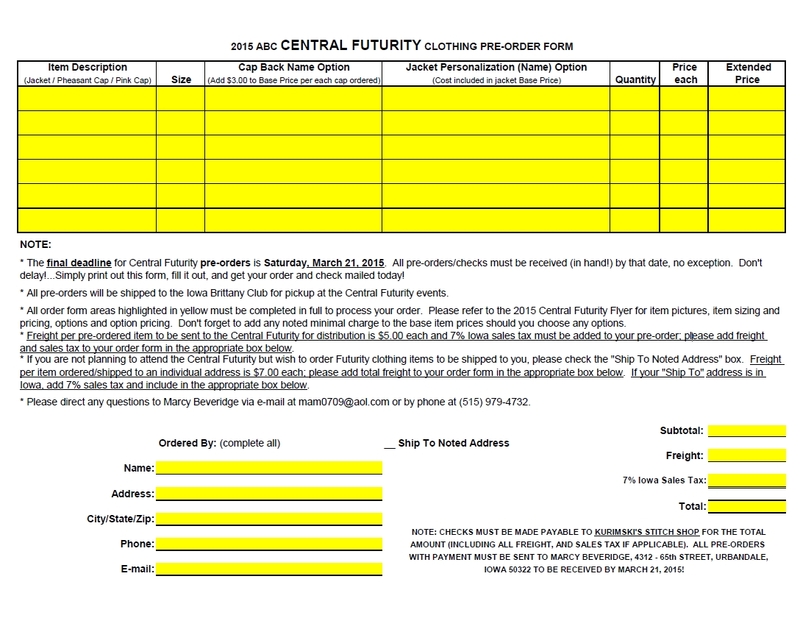 “Click here” for the Central Futurity clothing Order Form. You can enter your order information directly to the form via your computer (it is a fillable form), print out the completed form (print 2 copies if you’d like a copy for yourself as your order info cannot be saved), and mail it with your check….OR….you can print out the form, manually complete your order information, and mail it with your check. Please note order deadline dates on the order form and get your orders in early! We hope you’ll also look to join us for the full array of Iowa Brittany Club Spring Events being held in conjunction with the 2015 Central Futurity! Our Specialty Show and Sweeps will be held on Friday, April 3rd in Creston, Iowa immediately following the Futurity Show. The Iowa Spring Field Trial includes a full schedule of juvenile and adult stakes kicking off on Friday morning, April 3rd and running through Sunday, April 5th at the Union County Ranch near Thayer, Iowa. 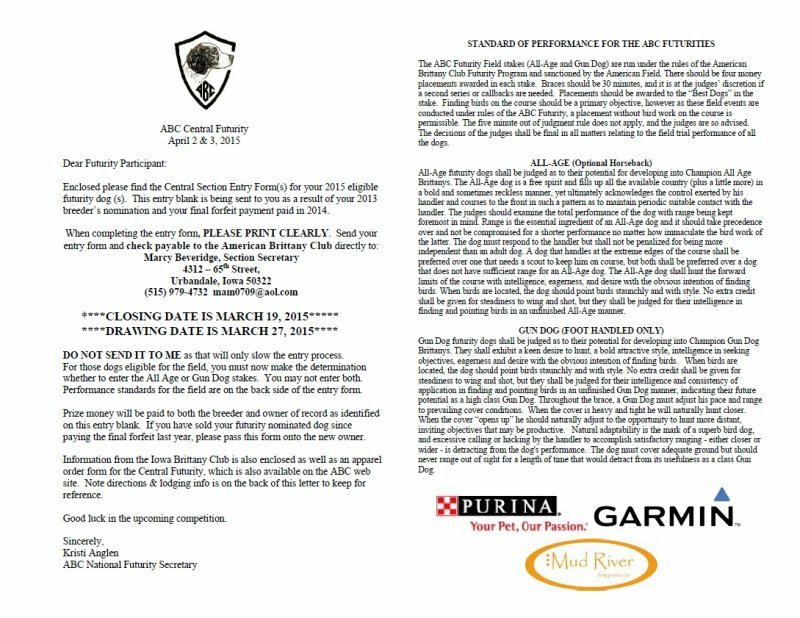 Additionally the Ed Powell Memorial Grand Open Ltd Gun Dog Hour Stake will start on Monday, April 6th and run through Thursday, April 9th. Premiums are posted on the ABC web site and the IBC web site. The Iowa Club is also putting together some fun activities during the Central Futurity/Iowa Spring Events. Be sure to keep checking the American Brittany Club web site and ABC Central Futurity Facebook page (links noted above) as well as the Iowa Brittany Club web site (www.iowabrittanyclub.com) for more updates and information!